Atherton Raspberry is a tropical raspberry native to Australia and Papua New Guinea. Unlike the exotic raspberry, this delightful bush tucker fruit can thrive in our warmer climates, and can be found in the wild throughout tropical, subtropical and warm temperate QLD. 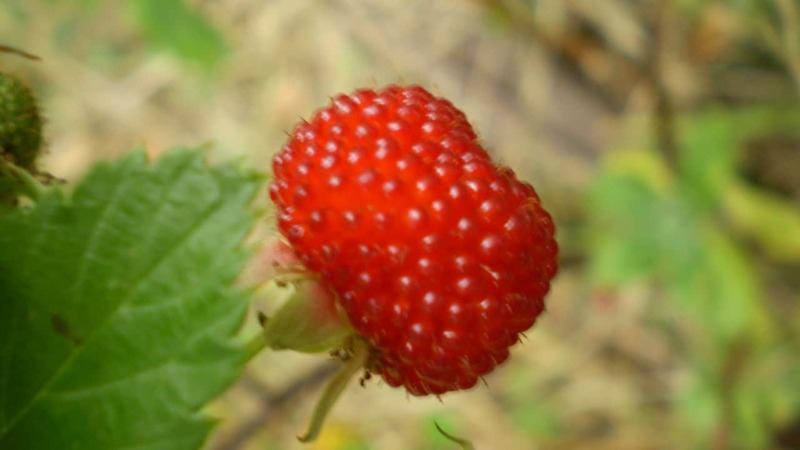 This species produces bright red berries, slightly larger in size and milder in taste than the more commonly known raspberries. Eat them fresh (raw) or use them in cakes, jams, jellies, syrups and sauces. A prolific bushfood shrub, the Atherton Raspberry typically fruits in Summer and Autumn, but has also been known to produce throughout most of the year in some regions. The secret to taste is timing — these berries may turn red long before they’re truly ripe. Wait until the fruit practically falls off its stem when touched. This could take weeks to start with, but once they get going, be prepared for frequent harvests! We recommend growing Atherton Raspberry in a large pot, due to its aggressive vigor. Left unchecked, it’s not uncommon for a healthy specimen to take over an entire garden bed. For best results, choose a loamy, well-drained soil, and place your plant in full sun, though you may still get reasonable results in part shade. This dense, prickly bush typically grows up to 2m tall and 2m wide, and may be trellis-trained. It’s the perfect little fruiter for a patio or balcony garden. How often should I prune my Atherton Raspberry? Prune once a year after fruiting around June or July, removing canes older than two years to make way for younger vigorous new shoots. Fruiting is best on one year old canes that have side laterals. If planted in the ground, remove side suckers to keep restricted. Do I need to fertilise my Atherton Raspberry? While this plant tolerates poor soils, fertilising with an organic compost at the start of the growing season (August) ensures better results at harvest time. When will my Atherton Raspberry produce fruit? Fruiting should begin within the first year. If you’ve had your plant for a while and it’s still not producing, try moving your plant to a sunnier spot, and adding a very small amount of potash to the soil. While potash won’t induce flowering or fruiting, it can help with soil nutrient ratios that contain too much nitrogen.